Tis’ the season for glitzy galas, fundraising fetes and holiday parties galore. Just when you thought October flew by, November promises to be another busy month with plenty of events happening here in the Fraser Valley. So go and ahead and grab you Ultimate Mom or Dad calendar, here’s what’s happening in your neck of the woods. P.S. you most definitely don’t have to be a parent to partake in the majority of these activities. 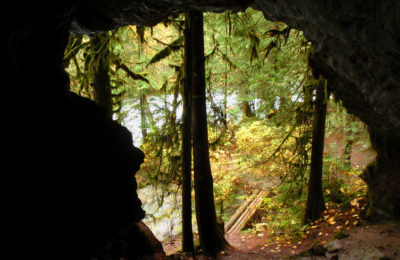 Let’s take a peek at what’s happening in the Fraser Valley for November 2015. Discover the Dinosaurs is a unique hands on exhibit coming to the Abbotsford TRADEX that consists of up to 40 moving and replica museum quality dinosaurs, giving you the opportunity to actually get close and touch the dinosaurs! Beyond the exhibit, additional fun activities are available for kids of all ages, which make spending the day with the dinosaurs a great experience for the entire family. Find out more HERE. Enjoy dinner and drinks as you watch new fall arrivals STRUT through the fashion show all while supporting a great cause in our own community “Big Brother and Big Sister”. 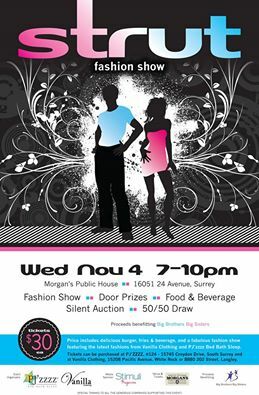 Tickets can be purchased at either Pjzzzz Bed Bath Sleep (604) 538-6338or Vanilla Clothing (604)542-5868. More info HERE. 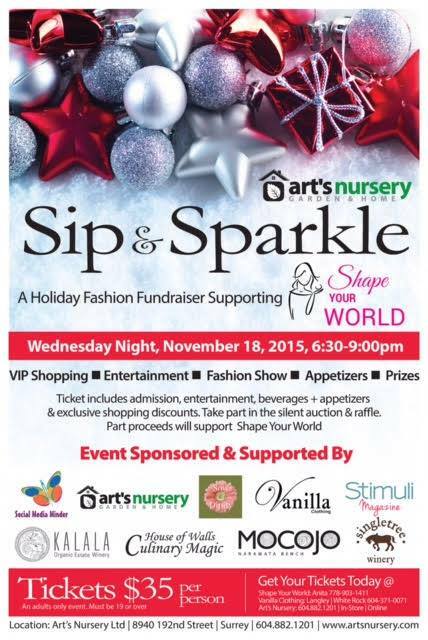 Sip some wine and savour some appies as you celebrate the holiday season and support families in need. 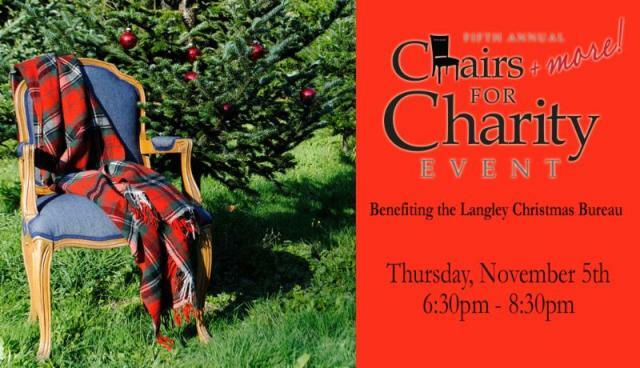 The business community of Downtown Langley has come together to help The Passionate Home raise funds for the Langley Christmas Bureau. They will be auctioning off a variety of items, including refinished chairs and other pieces of furniture. There will also have a selection of silent auction items.Tickets $10 and available online or in the store. Find out more HERE. Team Miracle Maya invites you to a Diwali party at the Bombay Banquet Hall. 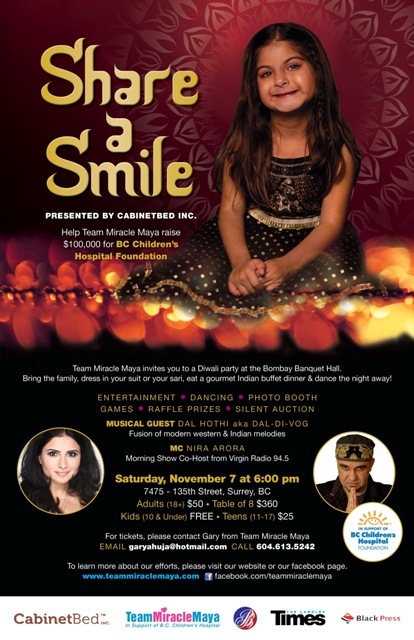 Bring the family, dress in your suit or sari, eat a gourmet Indian buffet dinner and dance the night away! This is a party you seriously don’t want to miss out on. Find out more information HERE. Every fall, LAPS holds a gala to celebrate the many happy endings that LAPS has helped create for Langley’s stray, lost and unwanted animals. This semi-formal event is LAPS’ biggest fundraiser of the year and brings together hundreds of animal lovers for an evening of dinner, dancing, live entertainment and live and silent auctions. LAPS is a small organization but this event has helped us do huge things for companion animals in the City and Township of Langley. 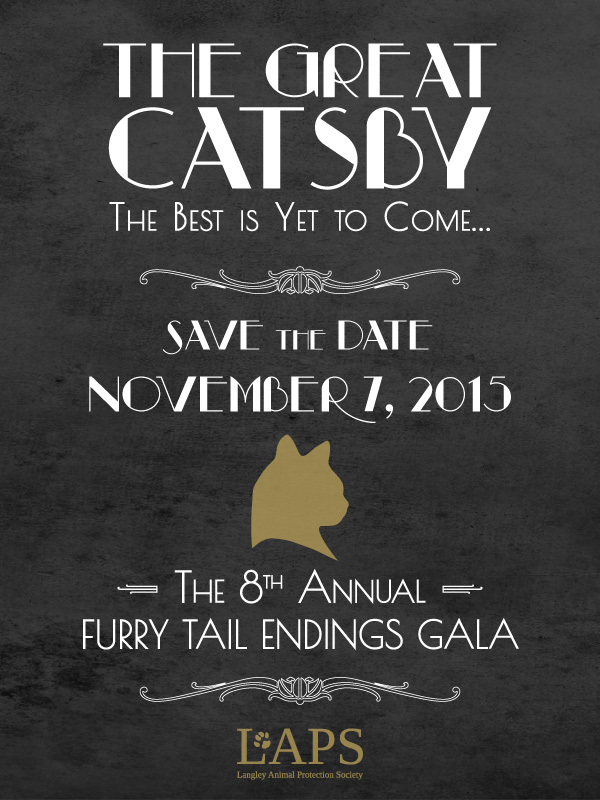 This year’s theme is “The Great Catsby” and the whole event is going to be bigger and better than ever! Come celebrate Langley’s social event of the year at the Coast Hotel & Convention Centre on November 7, 2015 and show your support for animals in need. For ticket information, click here. 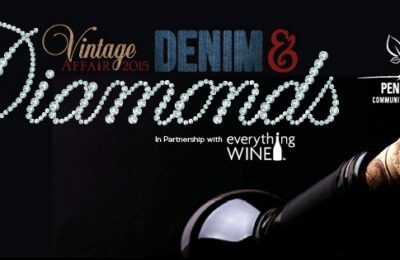 The Little White House & Co. in Fort Langley is hosting an exclusive evening of vintage faire, petite savouries and sweets, holiday punch and give-aways. Tickets: $28. Find out more info HERE. Bring the family for the Remembrance Day ceremony at the Cloverdale Cenotaph, then come in from the cold for refreshments, films and crafts. At 11:30a.m., join former Royal Canadian Navy Wren Gwen Settle as she shares Cold War secrets. All ages, by donation. More info HERE. Join in commemorating Canada’s National Remembrance Day. The ceremony will take place at the Cenotaph in Thunderbird Memorial Square off Veterans Way. More info HERE. 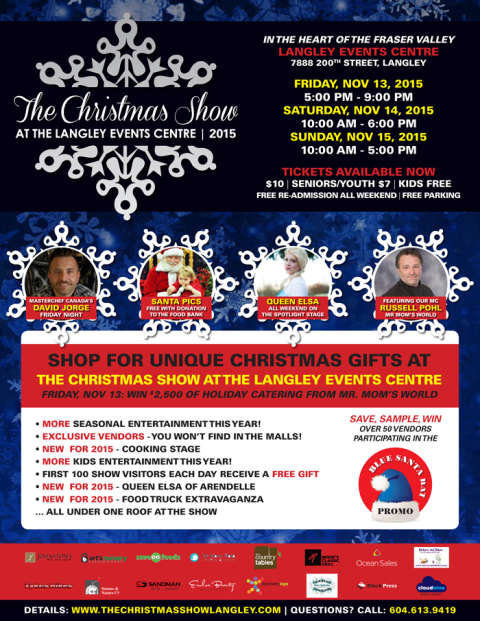 Shop, learn, taste and experience the best the holiday season has to offer at the 2nd Annual Christmas Show – at the Langley Events Centre November 13, 14, 15, 2015. Parking is FREE! Three fun filled days of reveling in the contagious holiday spirit right in the Heart of The Fraser Valley! Featuring 200 holiday décor, fashion, food and gift exhibitors, it’s a shopping extravaganza not to be missed. 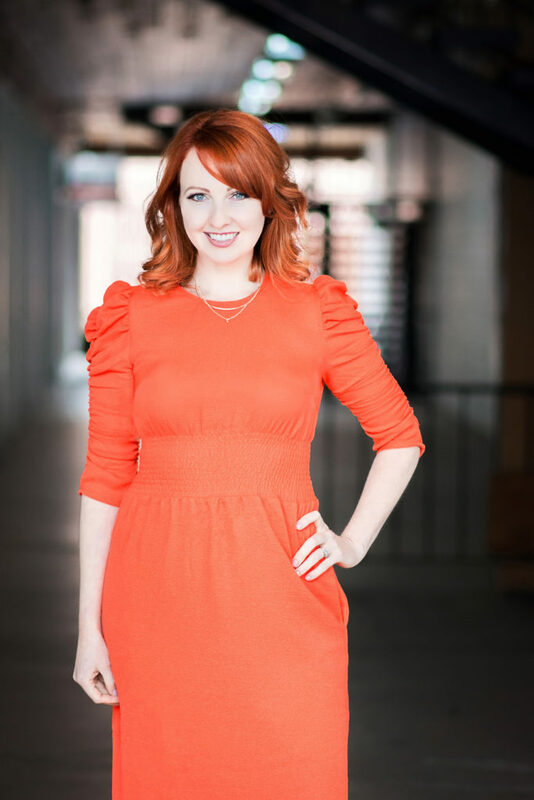 Visitors will be treated to an exciting schedule of guest appearances on the main stage. Lots of activities for the kids, not to mention each child will receive a FREE picture with Santa. 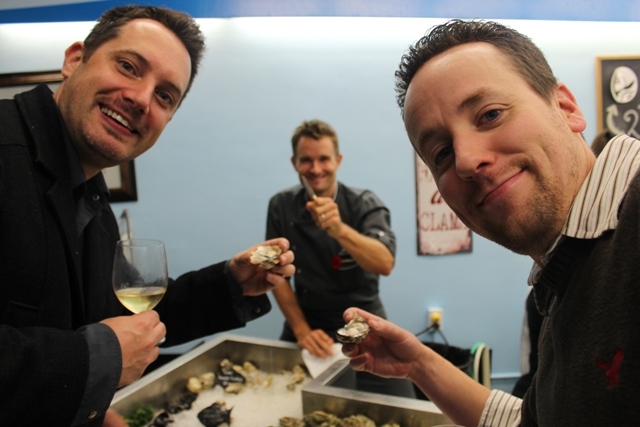 Combine local wine and tapas with the secrets of the Museum vault for a unique night out. Get a behind-the-scenes look at the “dark things” in our collections then sip and socialize. Must pre-register at 604-592-6956. 1 session $15 (19yrs+). 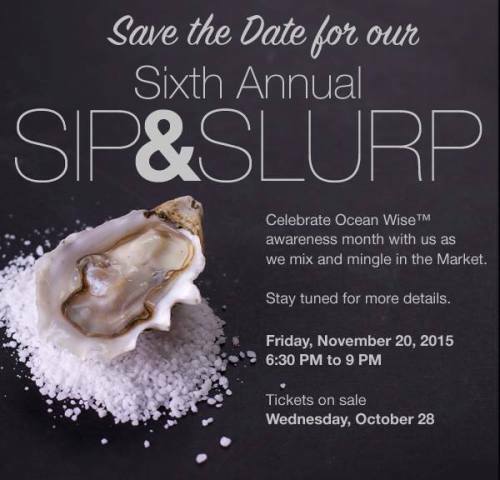 Celebrate Ocean Wise Awareness Month as you mingle, sip and slurp in the market. More info coming soon. The most unique Christmas gifts you will ever find, created by both artisans and favourite manufacturers. Hundreds of vendors under one roof; old fashioned Christmas activities for the children, Santa and his elves, local community and school groups singing Christmas carols, a Festival of beautifully decorated Christmas trees, home decor & Holiday cooking stage presentations. 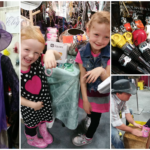 Experience the magic of Christmas and create family holiday memories at The West Coast Christmas Show, November 20: 12pm – 9pm, 21: 10am – 6pm & 22: 10am – 5pm, 2015 at Tradex in Abbotsford, with free parking. For more info, click HERE. It’s a holiday tradition in the making! Love a good show to get you in the holiday spirit? We’re having one that includes an 80-piece marching band. And at more than 60 feet tall, we think our Christmas tree might be one of the tallest in all of Canada! We’ll have dancers, stilt walkers, and the most special guest of all (besides you): Santa! The snow will fall – we guarantee it, and we’ve planned a tree lighting ceremony you won’t want to miss. Save the date. This is going to be bigger than Santa’s naughty list! More info HERE. Bloom Market, Fort Langley’s high quality artisan market, will be taking place November 21-22 at the historic Fort Langley Community Hall. The market will feature handmade gifts from 27 talented lower mainland artisans. Find unique gifts like art, jewerly, fashion, baby items and holiday treats. 10am – 5pm Saturday and Sunday. 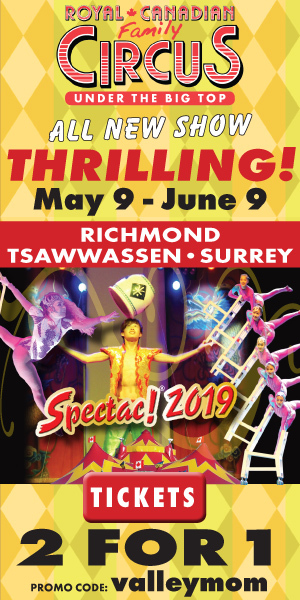 Admission $2 (kids 12 and under free) with proceeds benefiting Langley Animal Protection Society (LAPS). Click HERE for more info. SAVE THE DATE! Ticket details to follow. Sponsored by Art’s Nursery, Vanilla Clothing, House of Walls, Stimuli Magazine, Social Media Minder. Partial proceeds to benefit SHAPE YOUR WORLD Society. 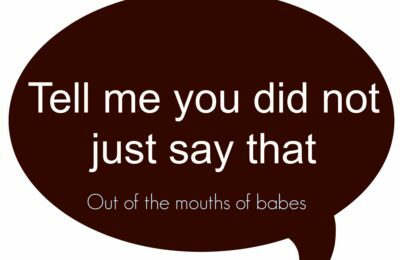 Tell me you did not just say that!